Robert Augustus Cheesebrough was a chemist from Brooklyn, New York, who spent a good deal of his professional life trying to extract kerosene from canned oil. He got the idea while living in Pennsylvania, when he noticed that a colourless substance collected around oil-well pumps that clogged up the pipes. Workers on the pumps used this jellylike substance on cuts because it stopped the bleeding and seemed to disinfect the wound. 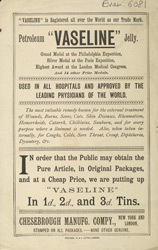 Cheesbrough analysed the jelly and discovered that it was essentially oil without kerosene. Cheesebrough found a way to manufacture this substance and called it Vaseline. Its name derives from Cheesebrough's method of storing the jelly - he made so much of it he had to keep it in his wife's flower vases.